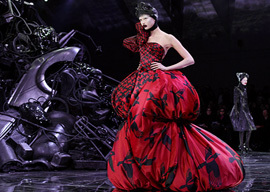 McQueen “expanded the understanding of fashion beyond utility to a conceptual expression of culture, politics, and identity,” The New York Times continues, displaying a rather limited understanding of both art and utility. They tell us McQueen was an artist because he was making things that were not immediately useful—and he was an artist, the walls insist, because he was expressing himself. Juicers and oil wells are expressive. Children and mediocre memoir writers are self-expressive. Artists, however, do not squeeze out some raw substance that exists fully formed on the inside; they spend their time making things, bringing things into existence through the act. What issues is not an idea, but an object—only an object and nothing more. Amid the profusion of wall text is this quote by McQueen: “Everything I do is based on tailoring.” The organizers should have left it at that. He had a strong imagination and his clothes were extremely well-tailored. The dresses are not stories or sculptures; they are dresses, beautiful dresses. In the next gallery however, at the Richard Serra show, transubstantiation is achieved and drawings become sculptures. The halls were empty, and the white walls almost bare, too, save for expanses of Belgian linen covered in black paint stick—flat and untailored and stuck to the wall, but somehow three-dimensional. They are monochromatic but somehow not monotonous. Being rather primitively suspicious of the mono—from mononucleosis to monotheism and monogamy—I’d never given much thought to monochrome’s potential, but I felt it there for the first time. The effect comes from friction: It is actually not monochromatic since the wall is part of the piece and the wall is white. It’s the contrast that strikes. “I don’t think so,” I answered. We didn’t do it. So we can’t have. But it has been done, and I shudder with the pleasure of it. Serra’s drawings seem easy to fabricate so we don’t think about their creation. McQueen’s skill was in tailoring, so rather than unwrap those complex patterns, we obsess over the simple stories behind them and stuff them to the seams full of concept. Are we really still stuck at knocking matter in favor of spirit and spitting on spirit for not being crafty enough? That is so last season. Mostly all these little notions get along just fine, rubbing against each other to thrilling effect in the body—as in bodies of work. Charlie Wing has his plastic mannequins and taxidermied sheep; Alexander McQueen—RIP—used leather, balsa, feathers, shells, or silk; and Richard Serra’s art, for me, culminates in his use of white linen and black charcoal. With the many or the minimal, with fabric or plastic or plaster, mass-produced or made to measure, matter in the right hands is made to matter.